If you were gonna leave behind some record of what the human singing voice sounded like, embed it into the rock, or shoot it into space, this is one of the handful that might come to mind. Because the compassionate and enlightened sound that Richie Havens' voice makes seems to speak to a humanity to which all might aspire. That combined with the fact that the topics he's always considered worthy of sharing revolve around personal freedom, love, and brother and sisterhood, creates the picture of an artist whose star in the musical heavens is not diminished by light of day. 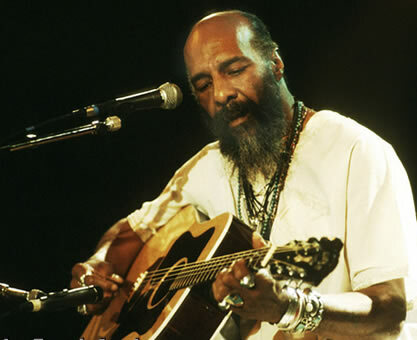 I was taken back by the down home urban demeanor of Richie Havens, who called from his workspace in Jersey City. His speaking voice (unlike his singing voice) was what you might expect from a man who grew up, as he did, in the Bedford-Stuyvesant section of Brooklyn. When, as a young man, he was painting portraits and listening to songwriters in the coffee houses and clubs of Greenwich Village back in the days when some of them would literally change the world, he had no idea that he would become one of those chosen few. He was immortalized in the flower power chapter of pop culture by opening up the Woodstock Festival. It's very funny to hear him tell the story of how that all happened despite the way he literally ran and hid from the life-changing opportunity. It's unbelievable, how his having to improvise a song because there was no one else to put on stage and because half the equipment was still stranded, along with thousands of people, on the road to Yasgur's farm, resulted in the awesome rendition of the song "Freedom," perhaps the best known performance of the legendary event. Still an activist for peace and for the environment, Richie's conversational style was laced with political references and anecdotes. He continues to maintain an active touring schedule, and his classic baritone has graced many a TV commercial. The newest record, Wishing Well, features a herd of deep talent, a number of whom are touring partners with Richie at different times. My talented friend Walter Parks, co-founder of The Nudes (no longer touring, but their fine CDs are available at his website) played some beautiful guitar, and took excellent photos. There are some beautiful original songs, especially "Handouts in the Rain," which I've been listening to repeatedly. Havens' reputation is even stronger as an enlightening interpreter of the songs of others, and never more so than here. The unbelievable song that Willie Nile (see our review) wrote for Jeff Buckley, "On the Road to Calvary," gets an outstanding and reverent read on Wishing Well. Even more surprising is his turning out of the radio hit by Gary Wright, "Love is Alive," shocking in its transcendent quality. The record ends with a moving version of Pink Floyd's "On the Turning Away" with just voice and drone accompaniment. It's great to have some Richie Havens back in my life. If he's not currently a part of yours, I think you'll feel the same way when you check out the clips on the Listen page, but even more so when you buy Wishing Well.